Coming to London has given Precious Jewell a taste of freedom, and she will do anything, bear anything, to keep it. Defying her master is at the top of her mind, and she wont let his unnerving charm sway her. Yet, will her restored courage lead her to forsake a debt owed to the grave and a child who is as dear to her as her own flesh? Gareth Conroy, the third Baron Welling, can neither abandon his upcoming duty to lead the fledgling colony of Port Elizabeth, South Africa nor find the strength to be a good father to his heir. Every look at the boy reminds him of the loss of his wife. Guilt over her death plagues his sleep, particularly when he returns to London. 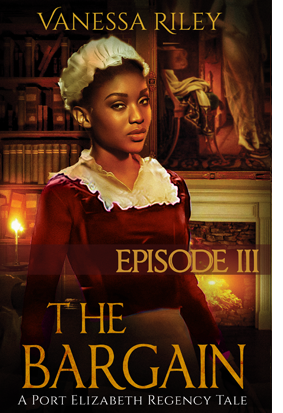 Perhaps the spirit and fine eyes of her ladys maid, Precious Jewell, might offer the beleaguered baron a new reason to dream. Here's a Sample. Please Enjoy & Maybe Buy! Nothing. No grunt. No deep voice, full of command answered. But no turning back either. She pried open the heavy double doors and slunk inside. The heat of the room stung her cheeks. The stench of liquor and cigar smoke hung in the air adding a sheen to the measly candlelight in the corner. A few more steps and she spied her master. Lord Welling slumped at the fireplace. His tall formed hunched over the white wood mantle as the huge portrait of Eliza hung over him. The fastidious man had his shirttails exposed beneath a rumpled waistcoat. A cranberry coat lay dumped on the floor. His head, crowned with thick brown hair, sat tucked in one arm. A clear goblet hung from the other. How drunk was he? Could she reason with him cast to the winds? The first day she saw him, his lean face held a hardy laugh. His wit, Mr. Marsdale said, could dice up a hard turnip. Maybe liquor slowed his brainbox down enough to agree to anything. "Aw, Eliza's Precious Jewell. My Precious Jewell." His voice with the stiff accent would be perfect for sermon making. The authority in the deep tones prickled her skin, made her feel as if she'd been caught being naughty. She nodded. "Yes, sir." He downed the amber contents of his drink then pounded the mantle. "Isn't" A hiccup left his pursed lips. "Isn't your job to see that the child sleeps, madam? Aren't you missing a moment to mother him?" Was he taunting her? Why? It was her responsibility to see about the child. His harsh tone almost sounded jealous. That couldn't be right. Alcohol was an evil thing. She should just say it. Give me papers to keep me free, off slave ships and out of brothels. Then no man could have the right to touch her. Looking into the baron's red-rimmed eyes, the words stuck in her craw. Courage dropping away, she turned. "Good night." "So the mouse is running away? Fine. Leave me, too." She weren't a rat, nothing that low. She fiddled with the pocket of her apron then rotated to face him. "You drink too much drink. There's no reasoning with a bottle." Like a foaming wave at the ocean, laughter poured out of him. "Tell me something that's not so obvious." He straightened and waved her forward. "You should drink with me too. You know what tonight is?" Of course she did. Everyone in Firelynn Hall knew. Precious just stared at him. He grunted hard and eyed her too. "It's the day I let your Miss Eliza die." Thunder crashed outside, and his hand closed tight about the glass, breaking it. Red poured from his palm. "Augh. Bloody thing." Precious dashed to his side and drew his hand up in her apron. "Foolhardy man." He winced and snatched his hand away. "I chose to go to my uncle, to do his bidding. Who knew they'd both die that night?" She felt for him, remembering the arguments Eliza had had with the master about who he loved more. Sympathy ate at her gut, but it disappeared when Precious spied her pristine apron darkening with growing red spots. "You fool. Youre bleeding to death." Charging him, she seized his palm, and plucked out two shards of glass. The fire spit at her as she tossed them to the hearth. "You think dying will bring her back? Nothin' will do that." His deep blue eyes beaded as he yanked his arm back. "That hurts, woman. Leave me. Let me drink to my lady gone." Droplets trickled onto his waistcoat as he gazed at Eliza's portrait. The eyes formed of paint seemed focused on him, probably disgusted at his drinking. The proud man would bleed to death. And, with the smears on her apron, she'd be blamed. Precious came in here for freedom, not a heap more trouble. She grabbed his hand again and bound it tightly, wrapping it around and around in her poor apron. "You got a boy. Eliza's son needs you." Lord Welling stopped fidgeting and let her tie a knot. His bloodshot eyes widened and seemed to settle on her face. "Well, as I leave to go defend my uncle's work, it will be you who cares for him." "He's a good boy, but he'll need his pa to make him a good man." "How can I show him that? I scarcely remember what that is." A final knot secured the makeshift bandage. The cuts of the glass had gone deep. "Start by not going to Africa. It's a bad place." She bit her lip, but the words burned too much to be silent. "My grammy talked of how it changed when y'all came." "Y'all?" His stiff accent, sort of questioning, sort of condescending, grated on her ear. He wiggled his fingers within the wrapping of her ruined apron. "You mean the slave traders, those y'all? The house of Welling never participated in such transactions." No, they just inherited slaves by marriage. The baron's hands weren't clean. They were wet in the stains of it, like now with his own spilt blood. She swallowed the irksome thoughts and focused on Jonas. That would be a reason for the man to stay. "Your son needs you here. There's nothin' worse than not seeing your pa. Even just a notion or whisper of him in passing, day to day is better than never." His face scrunched and then tilted up toward Eliza's picture. "She hated it here. Thought the weather too foul. I should've listened and made her last years more pleasant." That didn't make sense, but that's how guilt worked. She eyed his very lean cheeks through the lace of her floppy mobcap. His laugh dimples were missing. He was tall, too tall. "She was very pleased to be a baron's wife." "Pleased? Was she pleased waiting for my return from tending to my uncle's affairs? Was she happy waiting for the accoucheur to deliver the babe alone? Was she pleased she never got her title, dying before my uncle? Only a few hours separated them from Heaven's gate. Well, at least she made it in." Men were dumb about birthin'. "That baby didn't wait. Some women weaken in the process. It takes all they have to give life. The Lord just" She snapped her mouth shut as a belly full of laughs rolled out of his lips. "Stop, Jewell." He wobbled over to his sideboard and pried at the glass top of bottled spirits. The makeshift bandage must've prevented him from getting a good grip and popping it open. She plodded across the thick carpet, coming again within a few feet of him. "You can't need more." "I surely don't want less." His eyes widened and he drew himself up as if her boldness had suddenly penetrated his drunken brain. "I didn't ask you to be my keeper." A lazy smirk appeared, making his eyes a darker shade of blue. Such a turbulent river stirred within him, and sometimes it pulled her undertow, but Precious didn't like swimming or drowning. With a shake of her head, she looked away to the floor. "That's what I came to discuss before you are off to who knows where." He set down the bottle and rubbed at his neck, shoving his loose hair to the side. He wore it longer than most. It gave him more of a pirate look like in the stories Eliza read. "I was wondering when the mouse would say her piece." With a tug, he whipped off his rumpled cravat. "You've been skulking about ever since I returned to Firelynn Hall. Something tells me you have an ask. Say it." He'd noticed her. Had he seen the many times she let her courage slide away? Not again. She planted a hand on her hip. "I need my papers, sir." His eyes blinked, his forehead riddling with lines. "What papers?" "My freedom." Her voice sounded horrible, hollow and low. A quick cough and a short breath allowed her to strengthen her tone and appear strong. "I need papers to show, to get my next employment." "You need no other possibilities. You work for me." He pulled his massive arms together, almost missing the elbows he now cupped. "Why should you work elsewhere?" "The missus. She gave me my freedom that horrid night. Mr. Palmers was there. He heard it." The baron took a step backward, planting his foot close to the sideboard, almost falling. "You sly thing. You use the anniversary of her death to coerce me." "I speak truth." She picked up his brandy container and shook it. "The only things you listen to are these spirits." He reached for it. As if swimming in a mud hole, he stumbled forward with arms flying. She put her hand on his chest to steady him. He seized her arms, drawing her to his side. One massive arm pinned her against him. 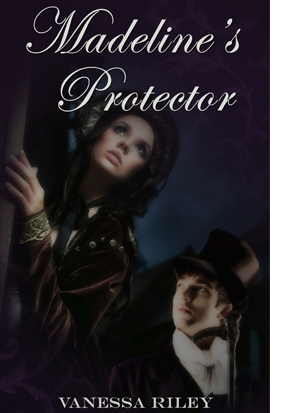 The buttons of his onyx waistcoat smashed into her cheek. His breath, soaked in liquor, blended with the hint of vanilla of his skin, along with the scent of ash and soot from the roaring fire. "Mouse, give it back." His words heated the crown of her head and his arms tightened about her. Shocked and shaking, she twisted and pushed to get free, but there was no budging from the baron's death grip. "Let me go." "Shhh. You're talking too much." With his free hand, he slid his fingers down the length of her back. She could feel his pinkie tracing the eyelets of her corset. Squirming, she tried to shift to keep him from picking at the ribbons of her undergarment. Being fully clothed didn't stop her panic. She rocked and pressed against his iron-like embrace to be free. Never, ever did it settle into her head that Lord Welling was like the rest; a man who took what he wanted. Brain swimming in a sea of choice brandy, Gareth Conroy, Lord Welling, held the thief in place. How dare the wench take his bottle and taunt him with it? He searched a little more, here and there, until his fingers claimed the dimpled glass from her fidgeting hands. "There, now I've found it." He released his grip and the mouse scampered away. Must be the effects of the drink, but did the girl look scared? She couldn't have thought to keep it all herself. He sloshed the bottle. Amber honey flooded to one side then the other. There was enough to share. Bosom heaving, she moved out his reach and trembled by the fire. "I need my papers." Her voice almost sounded as if she were choking. With a grunt, he pivoted and put his full concentration on liberating the stopper. Another second or two of quick jabs popped the top. He flung it with a thud to scamper across the waxed sideboard. His vision split it into two, so he let it be and poured a glass. "The morning papers have upset me of the riots, but they are nothing to be frightened of. We are safe here." Before he could fix his lips to the wiggling goblet of needed joy, the mouse came closer again. Her roasted-almond complexion bore hints of red along her cheeks. And, upon further inspection, he realized her curves held a sizeable endowment, not at all the scrawny thing that accompanied his wife from the Carolinas. "Miss Eliza gave me my freedom. Would you ignore her dyin' request, too?" He swallowed a gulp of fire, but his nerves felt doused with kerosene. His temper, which had deflated in his game of find the bottle, now raged anew. The maid's word too held accusation. And it made the cold stuff in his veins burn. "Be careful, madam. I'm indulging this interruption to my privacy, but even amusements have their limits." The censure in his voice did the trick. The pert Jewell lowered her chin as she clasped a wavering hand. It must be the brandy, for something in him suddenly saddened at the loss of her fire. He lifted the glass again to his lips but stopped. Perhaps if he kept from further soaking his brain, he could figure out why the mouse ran in here. Was she dashing for a clock? He put down the liquor. "You were very dear to my wife. I'd find you in each other's confidence. I watch you sometimes with Jonas. Same love." Jewell's countenance lifted. Her full lips parted and a resilient voice sounded. "Was always the way with us, since I could remember. That's why she freed me. You must make it right." Now the mouse gave orders? The blend of audacity and humble pie tweaked his humor and his pride. "Lady Welling didn't have the power to free you. Let me acquaint you to English law. Once a woman marries, all her money, possessions, even her rights become her husband's. So how could my wife give what she didn't have?" Thunder boomed, and the girl's chestnut eyes widened so much that flecks of emerald and gold showed, just like Eliza's. He reached for the girl to catch a part of his late wife, but Jewell ran. She passed through the patio doors, the one leading to the smallish garden and then to alley. From the popped opening, the wind hissed and spit into his study. The fool girl left him for the rain and the evils of dark London streets. He wobbled to the glass panes and leaned against it, staring at the sea of blackness, but couldn't find her. The buckets of water dumping from above hid her. Yes, God was good at taking things away from Gareth. A jolt went through him as he turned and witnessed his Eliza's painting bearing down on him, judging him for things out of his control. Gut burning, he put his sore palm to his head and tried to block the disappointment his love had had in him and his own noisy conscience. The cackle of taunting thunder forced him to swivel back to the window. How could he let Jewell go and take the last traces of Eliza, too? The vastness of the cresting ocean isn't enough to drown Precious Jewell's high spirits or her dreams of doing for herself, but a false move and an old nightmare have placed her in more jeopardy, Lord Welling's bedchamber. Captaining his schooner to Port Elizabeth was his only refuge, until his ship was invaded by land lovers, his son and his challenging caregiver. Perhaps, Miss Jewell's vivacity and audacity are just what he needs to quell rebellion amongst his crew and his heart. Precious Jewell has lived a life filled with disappointments, and it has caused her to wrestle with her beliefs. Port Elizabeth was meant to be a new beginning, not another chance to dance with death. With her eyes clouded in confusion, how can she protect young Jonas or even her new friend Mrs. Narvel? The guilt of kissing Eliza's husband and marveling at the black warriors who've attacked the colonists is gnawing at her, making her doubt her strength. What God is doing? Well, Precious is determined to figure things out and do what's best, even if it means forgetting her attraction to Lord Welling. Yet, will the man let her? Gareth Conroy has exposed his young heir, a pregnant woman, and his late wife's feisty maid to the dangers of Port Elizabeth. He must make things right, but what is that: admitting defeat and returning to London, staying and committing to a loveless marriage of convenience, or negotiating with Xhosa, a people set on the colonist's destruction? Time is running out for Port Elizabeth. A missing chief and his daughter, tensions among frightened colonists, and the trembling of a difficult labor, threaten to break the fragile bonds of its survival. Precious Jewell will do what is right to protect those she cares for, even for the man she won't admit to needing. For Gareth Conroy, death doesn't matter anymore, and he purposes that his spilt blood will bring salvation for the colony, but will he realize too late that no single man of flesh and blood can bring redemption? Will the burgeoning hope of two stubborn, wounded souls fray or smolder in this exciting conclusion of The Bargain?